A luxurious boutique hotel, the Harbour House Hotel is designed to pamper its visitors with an elegant yet comfortable ambience. Guests can relax in front of the fire in the longue and enjoy the free wine-and-cheese hour every evening. The hotel was recently been named one of the world’s best hotels by the website TripAdvisor. Niagara’s most critically acclaimed restaurant offers a variety of dining opportunities. Treadwell Farm to Table Cuisine’s combination of seasonal menus and award-winning wines makes this restaurant a must-try destination. There’s enough to do in Peller Estates Winery & Restaurant to fill an entire day. Sample wines, dine at their fantastic restaurant, take a tour of the winery, experience the ice wine, and take painting lessons in the vineyards. 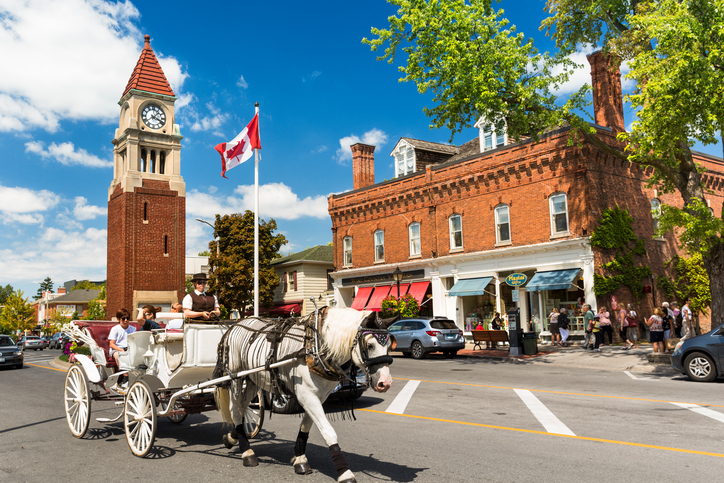 Prince Edward County is about picturesque county roads, vineyards, antique shops, and art studios. This island community is perfect for artists, nature lovers, and those longing for a relaxing weekend escape. Interested? Here are some of the county’s must-see places. Mixing rustic décor with modern art and mid-century furniture, this hotel boasts a unique brand of culture, community, and hospitality. Eleven fashionably designed guest rooms and two expansive suits await those looking for the perfect relaxing retreat. The Oeno Gallery features Canadian artists working on a variety of media, from photography to sculpture. The gallery offers more than just exhibition space; it has a four-acre outdoor sculpture garden which hosts events like jazz concerts. Hop on a bike and visit some of the region’s best wineries for tastings and tours. The guided County Wine Tours covers as many as four wineries where guests can get to sample more than 12 different wines. Featuring modern and contemporary art, the Albright-Knox Art Gallery is popular with locals and visitors alike. With a focus on 18th century pieces, the gallery has Claude Monet, Vincent van Gogh, Pablo Picasso, Frida Kahlo, and Andy Warhol in its collection. The birthplace of Buffalo wings, Anchor Bar is as down-to-earth as any dive bar, with a laidback vibe perfect for those who just want to hang out, down a few drinks, and enjoy some good food. Marvel at the amazing diversity showcased in this 12-acre historical site. It’s a great place to spend the day appreciating nature. Stroll through 10 interconnected indoor greenhouses each showcasing a different collection of plants. These collections include cacti and succulents, carnivorous plants and a medicinal garden, and many more. Go on a self-guided tour or opt for a free audio tour. Toronto is a city brimming with diversity and culture and close to many wonderful weekend retreats. Let Linda McEwan and Cheryl Thompson help find the best available Toronto luxury homes. Call at 416.960.9995 or send an email to lmmcewan(at)sothebysrealty(dotted)ca.